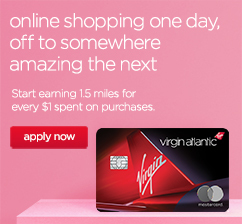 Browse Virgin Atlantic Shops Away and find a Retailer you'd like to purchase from. Then simply click on "Shop Now" and you’ll then go through to the Retailer's website where you can shop as normal. We'll track your purchases automatically and calculate how many miles you've earned. Your miles will show in your Virgin Atlantic Shops Away account as "Pending" within 5 working days. If your pending miles aren’t appearing in your Flying Club account after 5 days, please contact us. We'll validate your purchase with the retailer and update your account to show your miles as "Approved". It takes 45 days for a retailer to acknowledge and approve purchase and 90 to 120 days after you've completed your stay for hotel or travel bookings. Your purchases are subject to the retailers' terms and conditions. All "Approved" miles will be credited into your Virgin Atlantic account within 24 hours. If you've got more questions our FAQ page should provide all the answers. Enable your Internet browser cookies to be sure your miles are awarded to your Account. Cookies are used to track your path from the Virgin Atlantic Shops Away to the retailer's website and enable us to allocate the miles you earn from your purchase to your Virgin Atlantic Shops Away account. For more information on cookies click here.